The “Big Red” Service Award is being presented for the 14th consecutive year. It was established by the Hall of Fame Committee in 2005. 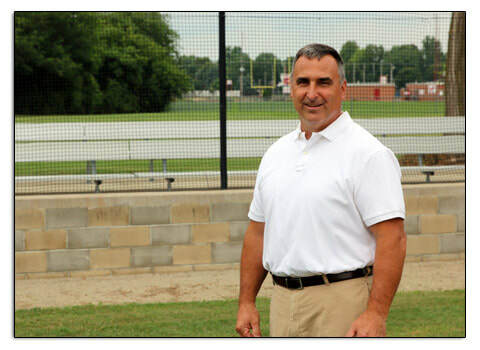 The Award was established to honor a person, group, organization, or business that has gone beyond the call of duty to assist the Bellevue Redmen Athletic Department, Coaches, and/or the Bellevue Redmen Athletic Booster Club. This year the Hall of Fame Committee is proud to announce and recognize Marc Weisenberger as the 2018 “Big Red” Service Award Recipient. Helped create the Bellevue City Center Activity Facility in 2001 and its expansion in 2011. Allowed our softball program, baseball program, and community youth programs to use the Bellevue City Activity Facility for youth clinics and practice both in season and out of season. Allowed our softball program to practice or play games at the Little League Field at Robert Peters Park. Led an upgrade to the main baseball field and facility at Robert Peters Park that our high school uses during its spring season. This included 1) new black fencing all around the entire field, 2) new back stop netting system replacing the old fencing, 3) new cement spectator tiered seating on both the home and visitor sides, 4) new stone backstop wall from dugout to dugout, and 5) removal of the old batting cage fencing, which allowed us to form a new pitching bullpen area, and also allow for more spectator viewing. Purchased infield mix and top dressing at various times for the baseball field at Robert Peters Park. Allowed our baseball coaches and athletic department to do various projects at the baseball field to help enhance the facility as a whole. Open to ideas and would help whenever he could with the various projects. Allowed our basketball teams to use the Recreation Center floor for practices in times where our high school facilities were unavailable. Also ran some summer youth camps at the Rec. Center. Allowed our volleyball program to use the Recreation Center floor for youth summer camps when our floor was unavailable due to summer maintenance. Allowed for the Recreation Center grounds to become our home cross country course the past 7-8 years. BHS now runs one or two home meets a season. Would drag and line the softball field on Sundays for youth softball games. Would share/donate baseball and softball field supplies when the high school teams and supplies were low during a wet spring. Worked together with Athletic Director Brian Schubert on the ordering of yearly baseball and softball supplies for the fields. Would team together to form one order, which enabled us to save some money on shipping. Worked well together with Bellevue H.S. Athletic Director’s John Rich and Brian Schubert. Shared community and school facilities for the betterment of both programs. Worked on projects together for the betterment of our community and school teams. ​This list could go on and on. Without a doubt, Marc has made a lasting impact on our community and our athletic programs at Bellevue High School. His desire to assist our programs gave our children and coaches a nice environment to foster their culture and programs. He helped continue a very positive and willing partnership for the betterment of our programs, our coaches, our children, and our community. We take this time tonight to thank him for his 18 years of service to our Bellevue Community and Bellevue H.S. Athletic Program. Job well done Marc! Thank you!! Brian Schubert presents the Big Red Service Award to Marc Weisenberger.